For teenagers in the United States, the highest cause of death for their age group is motor vehicle accidents according to research done by the Centers for Disease Control. If someone dies in this country before their 19th birthday, odds are high that the cause was a car crash. 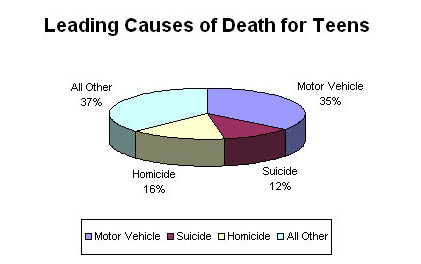 In 2010, seven teens ages 16 to 19 died every day from motor vehicle injuries. Per mile driven, teen drivers ages 16 to 19 are three times more likely than drivers aged 20 and older to be in a fatal crash. In 2010, about 2,700 teens in the United States aged 16-19 were killed and almost 282,000 were treated and released from emergency departments for injuries suffered in motor-vehicle crashes. While teenagers and young adults between the ages of 15-24 years represent only 14% of the U.S. population, they account for 30% ($19 billion) of the total costs of motor vehicle injuries among males and 28% ($7 billion) of the total costs of motor vehicle injuries among females. In 2010, 22% of drivers aged 15 to 20 involved in fatal motor vehicle crashes were drinking. In a national survey conducted in 2011, 24% of teens reported that, within the previous month, they had ridden with a driver who had been drinking alcohol and 8% reported having driven after drinking alcohol within the same one-month period. In 2010, 56% of drivers aged 15 to 20 were killed in motor vehicle crashes after drinking and driving were not wearing a seat belt. In 2010, half of teen deaths from motor vehicle crashes occurred between 3 p.m. and midnight and 55% occurred on Friday, Saturday, or Sunday. Teen drivers (and their passengers) are prone to not wear a seat belt: in 2011, 54% of high school students surveyed by the CDC reported that they sometimes do not wear a seat belt when they are riding as a passenger in a car. Teen drivers are the most dangerous of all driver groups when they are intoxicated. The automobile insurance industry monitors teenager driving carefully as part of their business of issuing automobile insurance coverage to young drivers. The research accumulated by their efforts may explain why teenagers are asked to pay higher insurance premiums than other drivers on the road. In 2011, 3,023 teenagers (ages 13-19) died in the United States from crash injuries. The crash risk among teenage drivers is particularly high during the first months of having their driver’s license. Most teenagers who die in car crashes are in sedans / passenger vehicles: eighty percent (80%) of teenagers killed in crashes in 2011 were passenger vehicle occupants. The others were pedestrians (10 percent), motorcyclists (5 percent), bicyclists (2 percent), riders of all-terrain vehicles (2 percent), and people in other kinds of vehicles (2 percent). Fifty-four percent (54%) of the teenagers who died in passenger vehicles were drivers and forty-six percent (46%) were passengers. Fifty-nine percent (59%) of the teenage passenger deaths occurred in vehicles driven by another teenager. The fatal crash rate per mile driven for 16-17 year-olds is about 3 times the rate for drivers 20 and older. The risk of dying in a car crash is highest for 16 year olds. Automobile crashes are the leading cause of death and injury to teens in America. Teenage vehicle collision deaths have reached epidemic proportions in the state of Florida. 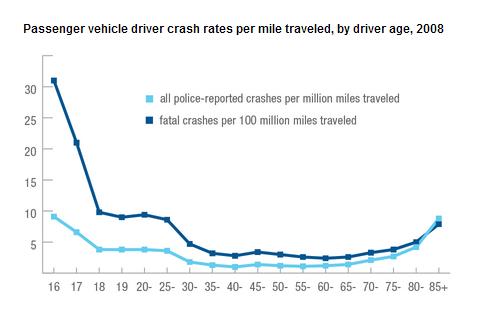 Florida reports the highest rate of crash involvement (ages 15 to 19 years). Florida has the highest rate in fatal crashes for teenagers. Florida has the 2nd highest rate in the country for teenage alcohol-related crashes. In Florida, between 25 to 30% of teen drivers will be involved in a crash within the first 12 months of getting their operator’s license.